This story is an amazing story of one of those old pioneers of aviation, Stanislaus Felix Hausner. A fearless aviator who tried to fly the Atlantic alone. I found this story in a series of Pottsville Miners Journal Newspaper articles in May and June of 1932. May 28, 1932… New York. 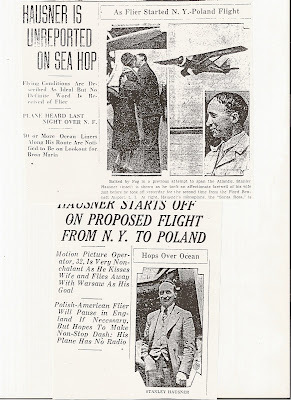 Stanley Hausner a virtually unknown Polish American flier, started today from Floyd Ben net Airport on a non stop trans-Atlantic flight which he hopes will take him either to London or Paris. He left the airport at 4:07 p.m. He started in the face of warnings from Trans Atlantic veterans including Col. Clarence Chamberlain, who flew from New York to Germany, and Rodger Q. Williams, who flew from Newfoundland to Rome. The skies had been clouded. Only this afternoon did the sun burn through the thick atmosphere and permit semblance of visibility, Then Hausner decided he would go, advised friends, kissed his wife and rolled the plane down the runway. After only a few minutes warming up he sent the heavily laden aircraft away, making a beautiful take off about midway of the long runway. Hausner’s papers were all made out for “Warsaw, Poland” and he told officials he hoped to make a non stop flight to London and then proceed t the Polish capitol after a stop in England. and experiencing trouble with his instruments. 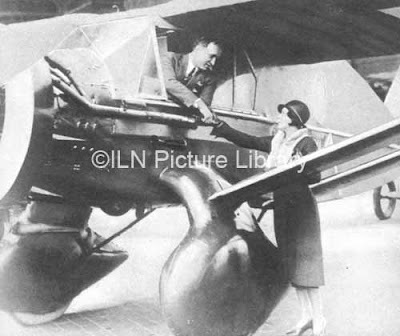 June 3rd, 1932HAUSNER STARTS ON PROPOSED FLIGHT FROM N.Y. TO POLANDMotion Picture Operator, 32, Is very nonchalant as he kisses his wife and flies away with Warsaw as his goal. Polish American Flier will pause in England if necessary. But hopes to make non stop dash: His plane has no radio! Floyd Bennett Airport, N.Y. June 3. Stanley Hausner, Polish American aviator started from Floyd Bennet Field today in an attempt of flying non-stop from New York to Warsaw, Poland. Hausner’s flame colored Bellanca monoplane the Rosa Marie, left the long concrete runway at 9:46 A.M. The ship had been wheeled out at 9A.M. and Hausner, usually close lipped about his plans announced he would try to reach the capital of his native Poland without a stop. The Rosa Marie was fueled with 525 gallons of gasoline and 25 gallons of oil. Hausner spent the night at the airport and was up and about at 6 a.m. His wife Martha was with him and at 7 o’clock father Paul Knappck, pastor of the Polish catholic Church of Newark arrived, father Knappck taught Hausner in school and is one of his closet friends. The smiling flier had breakfast with his wife at a roadside stand and then prepared some food to store in the plane. He took a quart of ice water four chicken sandwiches and some fruit. As the Rosa Maria was wheeled onto the field, Hausner, wearing a business suit, turned to his wife and remarked:”Well, its time to go” He kissed her and stepped jauntily down the field to the plane. Hausner said he would fly the great circle route, following the ship lanes. He was told by the weather bureau officials that conditions along that route are favorable. The takeoff was perfect. The plane left the 4,200 foot runway after a run of about 3500 feet. Hausner took of last Saturday in his first attempt to fly the Atlantic but turned back after reaching Nantucket because of dense fogs and a broken artificial horizon. WIFE TRAILS IN ANOTHER PLANE. He was extremely nonchalant about his start today. One airport official described him as “Transatlantic commuter” and remarked that he seemed no more concerned about his venture as if he was catching the 9:46 train for work. Mrs. Hausner wept as the plane shot down the runway. Then she got into another plane piloted by John Coyne, to fly with the Bellanca a short distance. The Rosa Maria, which carries the figure NR7085, is powered by a Wright whirlwind motor of 220 hp. It was originally built for a South Pole flight and was used by Brock Schlee in an endurance flight at Miami, Fla. In this flight it stayed aloft 59 hours. Hausner hopes to keep the air at least 50 hours. Hausner has no radio. He is carrying a parachute flares. A Navy plane which accompanied Hausner to Fire Island-75 miles out reported he was flying steadily at good altitude and waved them farewell as they turned to port. Flying conditions are described as ideal but no definite word is received of flier. PLANE HEARD LAST NIGHT OVER N.F. Stanley Hausner, Flying Pole” seeking air honors in an attempted flight from New York to Warsaw, was unreported late today though careful watch for him was set along the coasts of Ireland, England and France. Weather was in his favor. 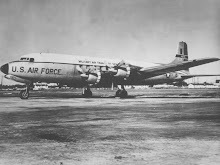 Early reports of trying conditions were supplanted by later tidings that atmosphere conditions had so improved over the eastern Atlantic that they were ideal for flying. The only hopeful word received was a message from Newfoundland, where residents of McCallum on the south coast reported having heard the roar of an airplane overhead at 7:40 o’clock EST last night. They thought it must be Hausner. The weather along the last stretches of the great circle route was reported sunny and windless, though a brisk headwind and low visibility, were reported earlier today. 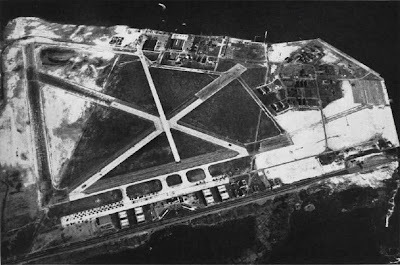 The 50 or more ships in the North Atlantic lanes appraised of Hausner’s takeoff at Floyd Bennet Airport, New York, yesterday morning were keeping a sharp lookout for his Bellanca monoplane, Rosa Maria, but wireless dispatches indicated Hausner had not been sighted. Lack of knowledge as to Hausner’s cruising speed made it difficult to estimate the approximate time of his arrival over Ireland and England. Though it was thought, that with good fortune, he should be sighted by nightfall. Before takeoff at 9:46 a.m. Hausner ranked as an amateur in aviation but confident of success said he would head for England and from that point would go for Warsaw. If his ship was not in good condition over England he intended to land at Croydon Airport here. Hausner is 32, a naturalized American citizen. His home is in Linden, N.J. His wife is staying at the home of her brother, Walter Wates, in Jersey City during the flight. She cried a little after her husband hopped off , but was sure he would succeed. Some Observers Think Sleet Probably Forced Hausner’s Plane Down In Ocean. Airdromes from London to Warsaw and air officials of several European nations who waited in vain for word from Stanislaus Hausner on his projected New York-Warsaw flight feared he had been lost in the Atlantic. The only possibility was that he might have landed somewhere on the continent where he would be out of communication with the world. His fuel supply would been exhausted early Sunday. A garage proprietor at Cork, Ireland, over which the great circle route would carry a flier over St. George’s Channel reported he heard the motor of a powerful airplane early Sunday. Officials could find no other residents of the district who reported hearing an airplane. St. John’s N.F…. Stanislaus Hausner, Polish American Atlantic flier, probably went down into the ocean, his plane progressed very far from the coast of New Found land, Members of the Master Mariners said today. They expressed the opinion that on the night of June 3, when he would have passed this coast, the weather was such that no plane could navigate. There was a strong northwest wind with fog, rain and soft snow early that evening, turning colder at night and near the freezing point. They believed the plane would have been weighted down by ice and sleet. Mrs. Martha Hausner “knows” her husband Stanislaus is too good a flier to be lost. Despite the fact that airport officials in Europe feared he had fallen victim to the Atlantic on his projected flight to Poland. Mrs. Hausner spent much of her time Sunday in prayer at the church in which she and Stanislaus are parishioners. the time of writing is making satisfactory progress, although unable to give a full and coherent account of his experiences. It is, perhaps, a happy coincidence that " Shell " have not only supplied the petrol for this unsuccessful Atlantic flight, but have also assisted in his timely rescue—" Shell Service " indeed! HAUSNER WAS ADRIFT A WEEK ON HIS PLANE. June 13, 1932 Pottsville Miners Journal. Captain of Vessel Which Picked Ocean Flier up 500 Miles Off Coast Of Portugal Gives Few Facts. Aviator Too Weak To Supply Details. Asks That Wife Be Informed. He Is Exhausted But Un Hurt. Was Forced Down: Plane Not Salvaged. By Captain James H. Wilson. Master S.S. Circe Shell. Aboard S.S. Circe Shell of Azores en route to New Orleans, June 13. Stanislaus Felix Hausner was making slow but favorable progress aboard my ship today after drifting at sea for a week in his wrecked monoplane, forced down on a projected New York – Warsaw flight. Hausner was still in a very weak condition unable to give a coherent account of his experiences. He had a scant rations during the week from June 3 until he was picked up by the Circe Shell Saturday. Fortunately the sea had been calm. He has not been able to tell much about his flight, but asked me to express his thanks for radio messages sent to him and to send his love to his family . Please inform Mrs. Hausner her husband is exhausted but uninjured. Hausner made a force landing at 9 p.m. GMT on June 3. When the Circ Shell spotted him it was dark. We were unable to salvage his plane. He is proceeding with our ship to New Orleans, where we are due June 27. The monoplane was last sighted drifting southeastward at about one knot. Hausner asked that any passing vessel try to salvage it as he believes it is in fairly good condition. The calm sea and fine weather prevailing all the time he was adrift probably prevented the plane from going to pieces on the water. Mrs Margaret Hausner, dark, slender wife of Hausner rescued after eight days adrift on the Atlantic” never gave up hope” that her aviator husband would be found. “I had faith in Stanislaus and I prayed for him constantly,” Mrs. Hausner told reporters. “People told me that I had better reconcile myself to being a widow., but I knew better. I knew he was somewhere alive and I prayed that somebody would find him before it was too late. Mrs Hausner said. He mutters as he falls into Lifeboat, utterly exhausted after being tossed about the ocean on his plane for eight days. “Thanks very much captain; I have been waiting for you for eight days.” Murmured Hausner, Trans Atlantic flier, as he collapsed on the deck of the Circe Shell, which rescued him 650 miles off the coast of Portugal after he had drifted for a week in his disabled plane. The Circle Shell left Antwerp bound for New Orleans on June 7, carrying creosote. Nothing of note occurred down the channel. The Lizard, our last view of home, was left late in the afternoon of the eight. I decided to deviate from the usual seasonal course, ”The hole in the Wall” Providence Channel, in consideration of our cargo. We steered for the pass between the westernmost Azores. The weather turned unusuall cold on the ninth and persisted with westerly windows and light sea. The Chief Officer made the discovery when he was observing to the westward and myself to the eastward. My attention was drawn to the chief who thought he observed a buoy on the starboard bow abou5t four miles off. The Circe Shell motors were put to slow and we approached to about one mile. Daylight was falling rapidly. Both engines were stopped close on the derelict. We were amassed to see a figure which seemed lashed to the machine, the plane heaved in the increasing sea. We blew the siren. The figure moved and waved frantically. It was obviously not lashed.. The life boat was ordered away with eager volunteers under the second officer. Hausner literally fell into the life boat. He was helped aboard in almost complete darkness, to be greeted by the whole crew of excited Chinese 45 minutes after first be sighted. His need for water after eight days must have been great. How his plane managed to survive the rigors of the tossing North Atlantic so long is amazing. Capt. Wilson is an Englishman, a seaman of many years experience. He made several rescues of torpedoed vessels during the war. He was making his first trip as master of the Circe Shell. Mrs. Hausner is planning a big dinner for her husband when he returns of steak and mushrooms, the flier’s favorite dish. “He’ll be well enough to eat by then” She said. This vacation city declared a holiday of its own today for Stanley Hausner, unknown motion picture operator who clung seven days without food or water to his wrecked plane, then told folks here that “if I had a plane, I’d be willing to try the same flight tomorrow. Hausner was reunited with that wife in a dramatic scene aboard the Circe Shell here just before last midnight at a point some 12 miles off shore where the Circe Shell paused enroute to New Orleans. She and the party of forty had left Miami on a gally decorated yacht, the seven seas, once a training ship in the Swedish navy. Hausner told his story to friends aboard a tug, repeated it as soon as he reached land, and then told a crowded theater full of celebrating vacationers the same story early today. “I had covered approximately 2800 miles when engine trouble developed at 9 a.m. After 29 hours in the air. I couldn’t find the trouble and decide d I have to land. “Between the time I decided to land, and the time I actually landed I saw 15 ships, but none saw me. “I landed between two big waves. Due to empty gas tanks, and the buoyancy of the plane, it nosed a bit into the water and remained afloat. “I lost every bit of food and water aboard. For seven days I was literally without either Until Captain Wilson came along with his Circe Shell. “At no time did I lose hope of rescue, I never even thought of giving up. Hausner was paraded through the streets here today, and a big reception was planned for him at Jacksonville where he will stop later in the day enroute to Newark by airplane. been afloat since Hausner fell into the sea on June 4 during his Atlantic flight. Hausner, it will be remembered, was rescued, after eight days' afloat, by a Shell tanker.